Right Brain Brewery in Traverse City's Warehouse District is hosting a winter-long "Pintwood Derby." 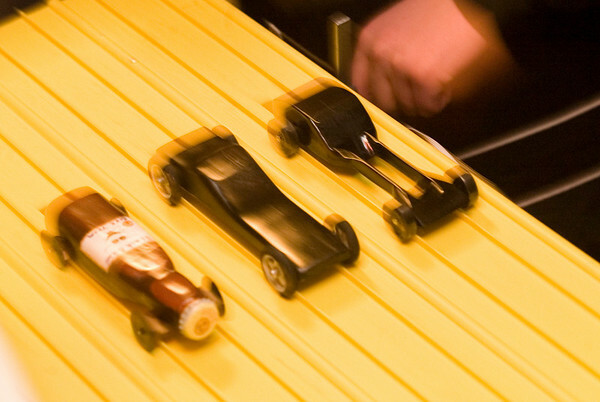 Participants can purchase a wood kit at the brewery, build a car and race it during weekly Wednesday night races. The final race takes place April 14. For more on the car-building racers and the race series, look for a story in the Arts & Entertainment section on Feb. 19. Cars start at the top of a 32-foot long track during Wednesday night Pintwood Derby races at Right Brain Brewery. The winner of each race moves on to the next round.